How/Is there a way to fix broken TASK links on Windows 7 for Google Chrome? Is there a way to fix these links? If not, would uninstalling and reinstalling Chrome work or put me back at the same problem? A few hours ago, opening a new page with an already open Chrome would not load or even give an error page. It remained blank. Internet connection was good so I disconnected & reconnected with no change. 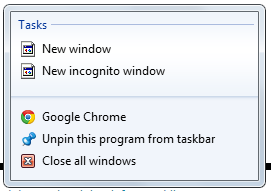 So I closed Chrome, clicked the pinned Shortcut on Taskbar to reopen, and nothing would happen. I opened Firefox & downloaded a new Chrome (without deleting old) hoping to "refresh" things and believe the shortcuts would work out then. Not so lucky. But opening the file location of the desktop shortcut, I clicked on "new_chrome" which transformed into "old_chrome" (it just did) which opened successfully. So thinking to put everything right again, I'd just uninstall Chrome. Did so (which removed both). But reinstalling gave an error that led to me doing a chkdsk to fix a corruption. With Google Chrome uninstalled & everything booting up normal, I reinstalled it. I can now click on the taskbar icon, the desktop icon, but these Tasks are broken. So now I'm here. Mine worked after this. You can also go back and un-check the privacy box you checked on step 2 and it should still work. Not the answer you're looking for? 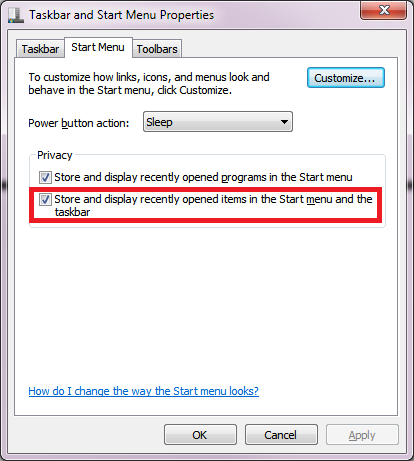 Browse other questions tagged windows-7 google-chrome keyboard-shortcuts taskbar or ask your own question. Is there a keyboard shortcut to get to the Apps section in “new tab” in Google Chrome?